To set up SSL, one needs to create a private key and get an SSL certificate from a certificate issuer. This article assumes that your private key and certificate are already ready so we can focus on configuring the OpenLitespeed side. The most important steps here are going to be setting Secure to “Yes” and making sure to set the listener to the right IP and port. You can generally set all listeners (secure and non-secure) to listen on all IPs, as traffic will be distributed by virtual host mappings (shown in section 3 below). The exception to this is if you want to bind a listener to a particular CPU. This requires a unique IP-port combination for this listener. Most HTTPS is done on port 443 by default, though, in this example, we chose port 8443 so as not to conflict with other listeners we already had set up. Lastly, click the Save button. First, go to the WebAdmin console => Listeners => Your Listener Name (since in this example, we named our listener SSL, we click SSL). 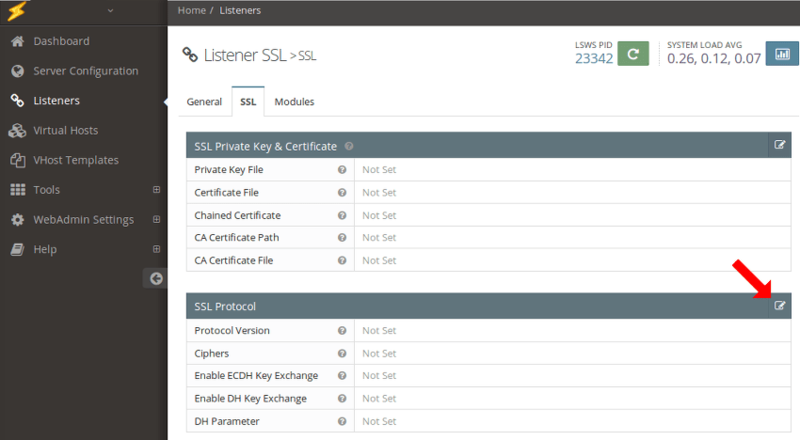 Next, click the SSL tab and then the Edit button for the SSL Private Key & Certificate section. 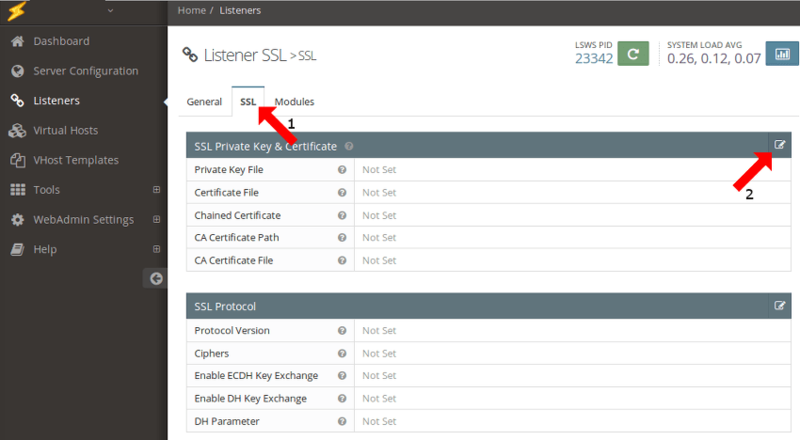 In the SSL tab, you will need to direct secure listeners to the private key and SSL certificate files you have created/obtained for HTTPS. Then click the Save button. Next, click the Edit button for the SSL Protocol section. Match your settings to the ones pictured below and click the Save button. Lastly, gracefully restart your server by clicking the Graceful Restart button. Again, go to the WebAdmin console => Listeners => Your Listener Name (since in this example, we named our listener SSL, again we click SSL). For new listeners, you need to map the virtual hosts that they will be listening for. These settings are found under the General tab. 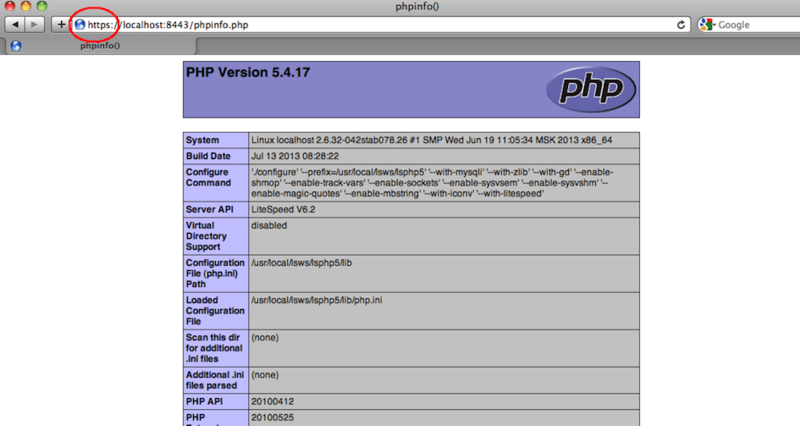 Click the Add button for the Virtual Host Mappings section. Lastly, gracefully restart your server by pressing the Graceful Restart button. We point our browser to https://localhost:8443/phpinfo.php. Note the https at the beginning of the URL indicating a secure connection. 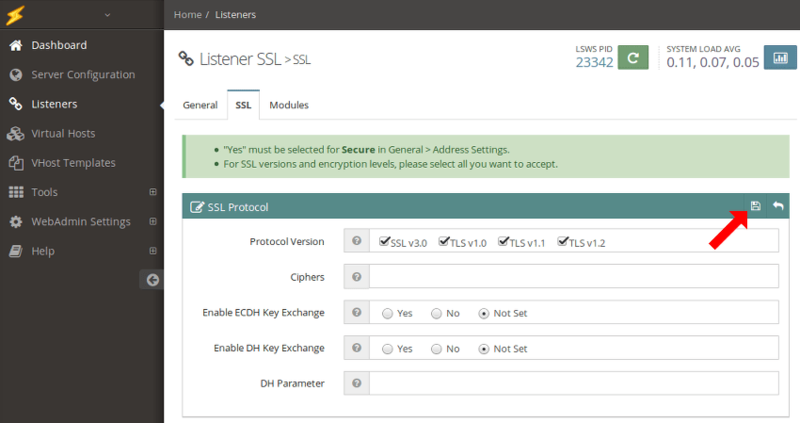 How to setup SSL in OpenLiteSpeed using WoSign Free SSL Certificates.